It is part of the manifold wisdom of God, that his gifts, in nature and grace, minister to distinct, and, as it often seems, unconnected ends; manifesting thereby the more His own Unity; as the secret cause and power of all things, putting Itself forward in various forms and divers manners, yet Itself the one Cause of all that is. The element which is the image of our Baptism, cleans es alike and refreshes, enlighteneth the fainting eye, wakens to life, as it falls, a world in seeming exhaustion and death, changes the barren land into a garden of the Lord, gives health and nourishment and growth. And if in nature, much more in the Gifts of grace. For therein God, not by Will or by Power only, but by Himself and the Effluence of His Spirit, is the Life of all which lives through Him. Our One Lord is to us, in varied forms, all, yea more than all, His disciples dare ask or think. All are His Life, flowing through all His members, and in all, as it is admitted, effacing death, enlarging life. As blind, He is our Wisdom; as sinful, our Righteousness; as hallowed, our Sanctification; as recovered from Satan, our Redemption; as sick, our Physician; as weak, our Strength; as unclean, our Fountain; as darkness, our Light; as daily fainting, our daily Bread; as dying, Life Eternal; as asleep in Him, our Resurrection. It is, then, according to the analogy of His other gifts, that His two great Sacraments have in themselves manifold gifts. Baptism containeth not only remission of sin, actual or original, but maketh members of Christ, children of God, heirs of Heaven, hath the seal and earnest of the Spirit, the germ of Spiritual life; the Holy Eucharist imparteth not life only; spiritual strength, and oneness with Christ, and His Indwelling, and participation of Him, but, in its degree, remission of sins also. As the manna is said to have "contented every man¹s delight and agreed to every taste," so He, the Heavenly Manna, becometh to every man what he needeth, and what he can receive; to the penitent perhaps chiefly remission of sins and continued life, to those who have "loved Him and kept His word," His own transporting, irradiating Presence, full of His own grace and life and love; yet to each full contentment, because to each His own overflowing, undeserved goodness. Having then, on former occasions, spoken of the Fountain of all comfort, our Redeeming Lord, His Life for us and Intercession with the Father, as the penitent¹s stay amid the overwhelming consciousness of his sins, it may well suit, in this our season of deepest joy, to speak of that, which, flowing from the throne of the Lamb which was slain, is to the Penitent, the deepest River of his joy, the Holy Mysteries; from which, as from Paradise, he feels that he deserves to be shut out, from which perhaps, in the holier discipline of the Ancient Church, he would have been for a time removed, but which to his soul must be the more exceeding precious, because they are the Body and Blood of his Redeemer. While others joy with a more Angelic joy, as feeding on Him, Who is the Angels¹ food, and "sit," as St. Chrysostom says, "with Angels and Archangels and heavenly powers, clad with the kingly robe of Christ itself, yea clad with the King Himself, and having spiritual armoury," he may be the object of the joy of Angels; and while as a penitent he approaches as to the Redeemer¹s Side, he may hope that having so been brought, he, with the penitent, shall not be parted from It, but be with Him and near Him in Paradise. "To the holier," says another, "He is more precious as God; to the sinner more precious is the Redeemer. Of higher value and avail is He to him, who hath more grace; yet to him also to whom much is forgiven, doth He the more avail, because "to whom much is forgiven, he loveth much." Would that in the deep joy of this our Easter festival, the pledge of our sealed forgiveness, and the earnest of endless life in God, we could, for His sake by Whom we have been redeemed, lay aside our wearisome strifes, and that to speak of the mysteries of Divine love might not become the occasion of unloving and irreverent disputings. Would that, at least in this sacred place, we could dwell in thought, together, on His endless condescension and loving-kindness, without weighing in our own measures, words which must feebly convey Divine mysteries; rather intent (as so many in this day seem) on detecting that others have spoken too strongly on that which is unfathomable, than on ourselves adoring that Love, which is past finding out. "When we speak of spiritual things," is St. Chrysostom¹s warning, on approaching this same subject, "Be there nothing of this life, nothing earthly in our thoughts; let all such things depart and be cast out, and be we wholly given to the hearing of the Divine word. When the Spirit discourseth to us, we should listen with much stillness, yea with much awe. ŒExcept ye each the Flesh of the Son of man and drink His Blood, ye have no life in you.¹"
The penitent¹s joy, then, in the Holy Eucharist is not the less deep, because the pardon of sins is not, as in Baptism, its direct provision. The two great Sacraments, as their very signs shew, have not the same end. Baptism gives, the Holy Eucharist preserves and enlarges life. Baptism engraffs into the true Vine; the Holy Eucharist derives the richness and fulness of His life into the branches thus engraffed. Baptism buries in Christ¹s tomb, and through it He quickens with His life; the Holy Eucharist is given not to the dead, but to the living. It augments life, or ‹death; gives immortality to the living; to the dead it gives not life, but death; it is a savour of life or death, is received to salvation or damnation. 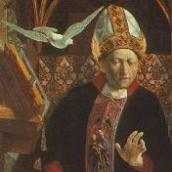 When the ancient Church so anxiously withheld from it such as sinned grievously, not as an example only to others, but in tenderness to themselves, lest they break through and perish; "profane," says S. Cyprian, "the Holy Body of the Lord," not themselves be sanctified; fall deeper, not be restored; be wounded more grievously, not be healed; since it is said, he adds, "Whoso eateth the Bread and drinketh the Cup of the Lord unworthily, is guilty of the Body and Blood of the Lord." The chief object, then, of the Holy Eucharist, as conveyed by type or prophecy, by the very elements chosen, or by the words of the Lord, is the support and enlargement of life, and that in Him. In type, the tree of Life was within the Paradise of God, given as a nourishment of immortality, withheld from Adam when he sinned; the bread and wine, wherewith Melchizidek met Abraham, was to refresh the father of the faithful, the weary warrior of God; the Paschal Lamb was a commemorative sacrifice; the saving blood had been shed; it was to be eaten with the unleavened bread of sincerity and truth, and with bitter herbs, the type of mortification, and by those only who were undefiled. The Manna was given to them after they had passed the Red Sea, the image of cleansing Baptism, and, as He Himself interprets it, represented Him as coming down from heaven, to give life unto the world, the food of Angels and the holy hosts of heaven; the Shew-bread was eaten only by those hallowed to the Priesthood, (as the whole Christian people has in this sense been made kings and priests,) and, when once given to David and those that were with him, still on the ground that the "vessels of the young men were made holy." The Angel brought the cake to Elijah, that in the strength of that food, he might go forty days and forty nights unto the Mount of God. In verbal prophecy, it is foretold under the images of the very elements, and so of strengthening and overflowing joy. "Wisdom," that is, He Who is the Wisdom of God, in a parable corresponding to that of the marriage feast, crieth, "Come eat of My bread and drink of the wine I have mingled." Or, in the very Psalm of His Passion and atoning Sacrifice, it is foretold, that "the poor shall eat and be satisfied;" or that He, the Good Shepherd, shall prepare a Table for those whom He leadeth by the still waters of the Church, and giveth them the Cup of overflowing joy;" or as the source of gladness, "Thou has put gladness into my heart, since the time that their corn and wine and oil (the eblem of the Spirit of which the faithful drink) increased," and "the wine which gladdeneth man¹s heart, and oil which maketh his face to shine, and bread which strengtheneth man¹s heart;" or of spiritual growth, "corn and wine shall make the young men and maidens of Zion to grow;" or as that which alone is satisfying, "buy wine without money and without price," for that "which is not bread;" or as the special Gift to the faithful, "He hath given meat unto them that fear Him;" or that which, after His Passion, He drinketh anew with His disciples in His Father¹s kingdom, "I have gathered my myrrh, I have drunk my wine with my milk; eat, O friends; drink, yea, drink abundantly, O beloved." In all these varied symbols, strength, renewed life, growth, refreshment, gladness, likeness to the Angels, immortality, are gifts set forth; they are gifts as to the Redeemed of the Lord placed anew in the Paradise of His Church, admitted to His Sanctuary, joying in His Presence, growing before Him, filled with the river of His joy, feasting with Him, yea Himself feasting in them, as in them He hungereth. Hitherto, there is no allusion to sin; it is what the Church should be, walking in the brightness of His light, and itself reflecting that brightness. And when our Lord most largely and directly is setting forth the fruits of eating His Flesh and drinking His Blood, He speaks throughout of one Gift, life; freedom from death, life through Him, through His indwelling, and therefore resurrection from the dead, and life eternal. "This is the Bread, which cometh down from heaven, that a man may eat thereof and not die. If any man eat of this Bread, he shall live for ever; and the Bread that I shall give is My Flesh, which I will give for the life of the world." "Except ye eat the Flesh of the Son of man and drink His blood, ye have no life in you." "Whoso eateth My Flesh and drinketh My Blood hath eternal life, and I will raise him up at the last Day." "He that eateth My Flesh and drinketh My Blood dwelleth in Me and I in Him." "As the Living Father hath sent Me and I live by The Father, so he that eateth of this Bread shall live for ever." No one can observe how this whole discourse circleth round this gift of life, and how our Lord, with unwearied patience, bringeth this one truth before us in so many different forms, without feeling that He means to inculcate, that life in Him is His chief gift in His Sacrament, and to make a reverent longing for it an incentive to our faith. Yet although life in Him is the substance of His whole teaching, the teaching itself is manifold. Our Lord inculcates not one truth only in varied forms, but in its different bearings. He answers not the strivings of the Jews, "How can this man give us ŒHis flesh to eat?" Such an "how can these things be?" He never answereth; and we, if we are wise, shall never ask how they can be elements of this world and yet His very Body and Blood. But how they give life to us, He does answer; and amid this apparent uniformity of His teaching, each separate sentence gives us a portion of that answer. And the teaching of the whole, as far as such as we may grasp it, is this. That He is the Living Bread, because He came down from Heaven, and as being One God with the Father, hath life in Himself, even as te Father hath life in Himself; the life then which He is, He imparted to that Flesh which He took into Himself, yea, which He took so wholly, that Holy Scripture says, He became it, "the Word became flesh," and since it is thus a part of Himself, "Whoso eateth My Flesh, and drinketh My Blood," (He Himself says the amazing words,) "eateth Me," and so receiveth into Himself, in an ineffable manner, his Lord himself, "dwelleth" (our Lord says) "in Me and I in Him," and having Christ within him, not only shall he have, but he "hath" already "eternal Life," because he hath Him Who is "the only true God and Eternal Life;" and so Christ "will raise him up at the Last Day," because he hath His life in him. Receiving him into this very body, they who are His, receive life, which shall pass over to our very decaying flesh; they have with them Him Who is Life and Immortality and Incorruption, to cast out or absorb into itself our natural mortality and death and corruption, and "shall live for ever," because made one with Him Who Alone "liveth for evermore." It is not then life only as an outward gift, to be possessed by us, as His Gift it is no mere strengthening and refreshing of our souls, by the renewal and confirming of our wills, and invigorating of our moral nature, giving us more fixedness of purpose, or implanting in us Christian graces; it is no gift such as we might imagine given to the most perfect of God¹s created beings in himself. Picture we the most perfect wisdom, knowledge, strength, harmony, proportion, brightness, beauty, fitness, completeness of created being; fair as was that angel "in the garden of God" before he fell, "the seal of comeliness, full of wisdom, and complete in beauty -- perfect in his ways from the day he was created." Yet let this be a perfection, upheld indeed of God, yet external to Him, as a mere creation, and it would fall unutterably short of the depth of the mystery of the Sacraments of Christ, and the gift, the germ whereof is therein contained for us; although such as we actuall are, we know that, for our strength we have weakness, for knowledge, ignorance, our nature jarring still, disharmonized, obscured, deformed, both by the remains of original corruption and our own superadded sins. For the life therein bestowed is greater than any gift, since it is life in Christ, life through His indwelling, Himself Who is Life. And Holy Scripture hints, that the blessed Angels, who never fell, shall in some way to us unknown, gain by the mystery of the Incarnation, being with us gathered together under one Head, our Incarnate Lord, into His One Body, the fulness of Him Who filleth all in all. Certainly, Scripture seems to imply, that, although He "took not the nature of angels" but "of man," yet all created beings, "thrones and dominions and principalities and powers," shall, if one may reverently say it, be more filled with God, when, this is Body being perfected, there shall be no check or hindrance to the full effluence of His Divine Nature, circulating through the whole Body, into which He shall have "knit things in heaven and things in earth," "the innumerable company of the Angels," and "the just made perfect;" and the whole glorified Church shall be clothed and radiant with him, the Sun of Righteousness. And of this we have the germs and first beginnings now. This is (if we may reverently so speak) the order of the mystery of the Incarnation, that the Eternal Word so took our flesh into Himself, as to impart to it His own inherent life; so then we, partaking of It, that life is transmitted on to us also, and not to our souls only, but our bodies also, since we become flesh of His flesh, and bone of His bone, and He Who is wholly life is imparted to us wholly. The Life which He is, spreads around, first giving Its own vitality to that sinless Flesh which He united indissolubly with Himself and in It encircling and vivifying our whole nature, and then, through that bread which is His Flesh, finding an entrance to us individually, penetrating us, soul and body, and spirit, and irradiating and transforming into His own light and life. In the words of a father who in warfare with the Nestorian heresy, lived in the mystery of the Incarnation, "He is life by nature, inasmuch as He was begotten of the Living Father; but no less vivifying also is His Holy Body, being in a matter brought together (sunhnegmenon) and ineffably united with the all-vivifying Word; wherefore It is accounted His, and is conceived as one with Him. For, since the Incarnation, it is inseparable; save that we know that the Word which came from God the Father, and the Temple from the Virgin, are not indeed the same in nature; for the Body is not consubstantial with the Word from God, yet is one by that ineffable coming-together and concurrence; and since the Flesh of the Savior became life-giving, as being united to That which is by nature Life, The Word from God, then, when we taste It, we have life in ourselves, we too being united with It, as It to the indwelling Word." "I then," He saith, being in him will by Mine own Flesh raise up him who eateth thereof, in the last Day. For since Christ is in us by His own Flesh, we must altogether rise, for it were incredible, yea rather, impossible, that Life should not make alive those in whom It is." To ad the words of one father only of the Western Church, ever had in honour, as well for his sufferings for the faith, as for his well-weighed and reverent language. S. Hilary adduced the very actualness of this union in proof against the Arians, that the unity of the Father and the Son, was not of will but of nature, not of harmony of will only. "For if the Word was truly made Flesh, and we, in the Supper of the Lord, truly receive the Word, being Flesh, how must He not be thought to abide in us, by the way of nature, Who being born man, took to Himself the Nature of our flesh, now inseparable from Him, and under the Sacrament of the Flesh which is to be communicated to us, hath mingled the Nature of His own Flesh with His eternal Nature. So then, we are all one, because both the Father is in Christ, and Christ in us. Whosoever then shall deny that the Father is in Christ by way of Nature, let him first deny that himself is by way of nature in Christ or Christ in Him; because the Father in Christ and Christ in us, make us to be one in them. If then Christ truly took the Nature of our Body, and that Man, Who was born of Mary, is truly Christ, and we truly, under a mystery, receive the Flesh of His Body, (and thereby shall become one, because the Father is in Him and He in us,) how is it asserted that the Unity is of will only, whereas the sacramental property (conveyed) through the Sacrament is the Sacrament of a perfect unity?" And a little after, alleging our Blessed Lord¹s words, "My Flesh is truly meat, My Blood is truly drink." "Of the truth of the Flesh and the Blood, there is no room left for doubt. For now, according both to the declaration of the Lord and our faith, It is truly Flesh and truly Blood. And these, received into us, cause, that we are in Christ and Christ in us. Is not this truth? Be it not truth to those who deny that Jesus Christ is true God. He then is in us through the flesh, and we are in Him, since this, which we are, is with Him in God." Would that, instead of vain and profane disputings, we could but catch the echoes of these hallowed sounds, and forgetting the jarrings of our earthly discords, live in this harmony and unity of Heaven, where, through and in our Lord, we are all one in God. Would that, borne above ourselves, we could be caught up within the influence of the mystery of that ineffable love whereby the Father would draw us to that oneness with Him in His Son, which is the perfection of eternal bliss, where will, thought, affections shall be one, because we shall be, by communication of His Divine Nature, one. Yet such is undoubted Catholic teaching, and the most literal import of Holy Scripture, and the mystery of the Sacrament, that the Eternal Word, Who is God, having taken to Himself our flesh and joined it indissolubly with Himself, and so, where His Flesh is, there He is, and we receiving it, receive Him, and receiving Him are joined on to Him through His flesh to the Father, and He dwelling in us, dwell in Him, and with Him in God. "I," He saith, "in the Father, and ye in Me, and I in you." This is the perfection after which all the rational creation groans, this for which the Church, which hath the first fruits of the Spirit, groaneth within herself, yea this for which our Lord Himself tarrieth, that His yet imperfect members advancing onwards towards Him, and the whole multitude of the Redeemed being gathered into the One Body, His whole Body should, in Him, be perfected in the Unity of the Father. And so is He also, as Man, truly the Mediator between God and Man, in that being as God, One with the Father, as man, one with us, we truly are in Him who is truly in the Father. He, by the truth of the Sacrament, dwelleth in us, in Whom, by Nature, all the fulness of the Godhead dwelleth; and lowest is joined on with highest, earth with heaven, corruption with incorruption, man with God. But where, one may feel, is there here any place for the sinner? Here all breathes of holy life, life in God, the life of God imparted to man, the indwelling of the All Holy and Incarnate Word, the Presence of God in the soul and body, incorruption and eternal life, through His Holy Presence and union with Him, Who, being God, is Life. Where seems there room for one, the mansion of whose soul has been broken down, and he to have no place where Christ may lay His head; the vessel has been broken, if not defiled, and now seems unfit to contain God¹s Holy Presence; the tenement has been narrowed by self-love, and seems incapable of expanding to receive the love of God, or God who is love; or choked and thronged with evil or foul imaginations; or luxury and self-indulgence have dissolved it, or evil thoughts and desires have made room for evil spirits in that which was the dwelling-place of the Trinity? Doubtless, God¹s highest and "holy" gift, is as the Ancient Church proclaimed, chiefly "for the holy." "Ye cannot be partakers of the Table of the Lord, and the table of devils." And as Holy Scripture, so also the Ancient Church, when alluding to the fruits of that most ineffable gift, speak of them mostly as they would be to those, who, on earth, already live in Heaven, and on Him Who is its life and bliss. They speak of those "clothed in flesh and blood, drawing nigh to the blessed and immortal nature;" of "spiritual fire;" "grace exceeding human thought and a gift unutterable;" "spiritual food, surpassing all creation visible and invisible," "kindling the souls of all and making them brighter than silver purified by the fire;" "removing us from earth, transferring us to heaven," "making angels for men, so that it were a wonder that man should think that he were yet on earth," yes, more than angels, "becoming that which we receive, the Body of Christ." For that so we are "members of Him, not by love only, but in very deed, mingled with that Flesh, mingled with Him, that we might become in a manner one substance with Him," "the one Body and one Flesh of Christ;" and He the Eternal Son and God the Word in us, "commingled and co-united with us," with our bodies as with our souls, preserving both for incorruption; "re-creating the spirit in us, to newness of life, and making us "partakers of the Divine Nature;" "the bond of our unity with the Father, binding us to Himself as Man," Who is "by nature, as God, in God His own Father;" "descending to our nature subject to corruption and to change, and raising it to Its own excellencies," and "by commingling it with Itself, all but removing it from the conditions of created Nature," and "re-forming it according to Itself." "We are," adds S. Cyril, "perfected into unity with God the Father, through Christ the Mediator. For having received into ourselves, bodily and spiritually, Him who is by Nature and truly the Son, Who hath an essential Oneness with Him, we, becoming patakers of the Nature which is above all, are glorified." "We," says another, "come to bear Christ in us, His Body and Blood being diffused through our members; whence, saith St. Peter, we become Œpartakers of the Divine Nature.¹"
Yet although most which is spoken belongs to Christians as belonging already to the household of saints and the family of Heaven and the Communion of Angels and unity with God, still, here as elsewhere in the New Testament, there is a subordinate and subdued notion of sin; and what wraps the Saint already in the third Heaven, may yet uphold us sinners, that the pit not shut its mouth upon us. The same reality of the Divine Gift makes It Angels¹ food to the Saint, the ransom to the sinner. And both because It is the Body and Blood of Christ. Were it only a thankful commemoration of His redeeming love, or only a shewing forth of His Death, or a strengthening only and refreshing of the soul, it were indeed a reasonable service, but it would have no direct healing for the sinner. To him its special joy is that it is His Redeemer¹s very broken Body, It is His Blood, which was shed for the remission of his sins. In the words of the Ancient Church, he "drinks his ransom," he eateth that, "the very Body and Blood of the Lord, the only Sacrifice for sin," God "poureth out" for him yet "the most precious Blood of His Only-Begotten;" they "are fed from the Cross of the Lord, because they eat His Body and Blood;" and as of the Jews of old, even those who had been the betrayers and murderers of their Lord, it was said, "the Blood, which in their phrenzy they shed, believing they drank" so of the true penitent it may be said, whatever may have been his sins, so he could repent, awful as it is to say, -- the Blood he in deed despised, and profaned, and trampled under foot, may he when himself humbled in the dust, drink, and therein drink his salvation. "He Who refused not to shed His Blood for us, and again gave us of His Flesh and His very Blood, what will He refuse for our salvation?" "He," says S. Ambrose, "is the Bread of life. Whoso then eateth life cannot die. How should he die, whose food is life? How perish, who hath a living substance? Approach to Him and drink, because He is a Fountain; approach to Him and be enlighteed, because He is Light; approach to Him and be freed, because, where the Spirit of the Lord is, there is liberty; approach to Him and be absolved, because He is Remission of sins." In each place in Holy Scripture, where the doctrine of the Holy Eucharist is taught, there is, at least, some indication of the remission of sins. Our Blessed Lord, while chiefly speaking of Himself, as the Bread of life, the true meat, the true drink, His Indwelling, Resurrection from the dead, and Life everlasting, still says also, "the Bread that I will give is My Flesh, which I will give for the life of the world." As amid the apparent identity of this teaching, each separate oracle enounces some fresh portion of the whole truth, so also does this; that His Flesh and Blood in the Sacrament shall give life, not only because they are the Flesh and Blood of the Incarnate Word, Who is Life, but also because they are the very Flesh and Blood which were given and shed for the life of the world, and are given to those, for whom they had been given. This is said yet more distinctly in the awful words, whereby He consecrated for ever elements of this world to be His Body and Blood. It has been remarked, as that which cannot be incidental, (as how should any words of the Eternal Word be incidental?) how amid lesser variations in the order or fulness of those solemn words, they still, wherever recorded, speak of the act as a present act. "This is My Body which is given for you;" "This is My Body which is broken for you;" "This is My Blood of the New Testament which is shed for many for the remission of sins;" "This Cup is the New Testament in My Blood, which is shed for you." He saith not, "which shall be given," "shall be broken," "shall be shed," but "is being given," "being broken," "being shed," (d idomenon , klwmenon, ekcunomenon ,) and this in remarkable contrast with His own words, when speaking of that same Gift, as yet future, "The Bread which I will give is My Flesh, which I will give (Œon ¹egwdwsw) for the life of the world." And of one of the words used, S. Chrysostome remarks how it could not be said of the Cross, but is true of the Holy Eucharist. "For Œa bone of Him,¹ it saith, shall not be broken.¹ But tat which He suffered not on the Cross, this He suffers in the oblation for thy sake, and submits to be broken that He may fill all men." Hereby He seems as well to teach us that the great Act of His Passion then began; then, as a Priest, did He through the Eternal Spirit offer Himself without spot to God; then did He "consecrate" Himself, before He was by wicked hands crucified and slain; and all which followed, until He commended His Blessed Spirit to the Hands of His Heavenly Father, was One protracted, willing, Suffering. Then did He begin His lonely journey, where there was none to help or uphold, but He "travelled in the greatness of His strength;" then did He begin to "tread the wine-press alone," and to "stain all His raiment;" then to "wash the garments" of His Humanity "with" the "Wine" of His Blood; and therefore does the Blood bedew us too; it cleanses us, because it is the Blood shed for the remission of our sins. And this may have been another truth, which our Lord intended to convey to us, when He pronounced the words as the form which consecrates the sacramental elements into His Body and Blood, that that Precious Blood is still, in continuance and application of His One Oblation once made upon the Cross, poured out for us now, conveying to our souls, as being His Blood, with the other benefits of His Passion, the remission of our sins also. And so, when St. Paul says, "The cup of blessing which we bless, is it not the participation of the Blood of Christ?" remission of sins is implied by the very words. For, if we be indeed partakers of His atoning Blood, how should we not be partakers of its fruits? "That which is in the Cup," S. Chrysostome paraphrases, "is that which flowed from His side, and of that do we partake." How should we approach His Sacred Side, and remain leprous still? Touching with our very lips that cleansing Blood, how may we not, with the Ancient Church, confess, "Lo, this hath touched my lips, and shall take away mine iniquities and cleanse my sins?" There is, accordingly, an entire agreement in the Eucharistic Liturgies of the universal Church, in prayer, in benediction, in declaration, confessing that in the Holy Eucharist there is forgiveness of sins also. Those of S. James and S. Mark so paraphrase the words of Consecration as to develope the sense that they relate not only to the past act of His Precious Bloodshedding on the Cross, but to the communication of that Blood to us now. "This is My Body which for you is broken and given for the remission of sins." "This is My Blood of the New Testament, which for you and for many is poured out and given for the remission of sins." Again, the Liturgies join together, manifoldly, remission of sins and life eternal, as the two great fruits of this Sacrament. Thus in the prayer for the descent of the Holy Ghost on the sacred elements, "that they may be to all who partake of them to the remission of sins, and to life eternal;" or in the intercession, "that we may become meet to be partakers of Thy holy mysteries to the remission of sins and life eternal," or in the words of communicating, "I give thee the precious and holy and undefiled Body of our Lord and God and Saviour Jesus Christ for the remission of sins and life eternal." And the prayer in our own liturgy is almost in the very words of an Eastern and in the character of a Western Liturgy, "that our sinful bodies may be made clean by His Body and our souls washed through His most precious Blood." Even the Roman Liturgy, though less full on this point, has prayers, "that the Communion may cleanse us from sin," "may be the washing away of guilt, the remission of all offences." It will then seem probably too refined and narrowing a distinction, when some Divines of that Communion, countenanced by the language of the Council of Trent, maintain in opposition to other error, that venial sins only are remitted by the Holy Eucharist, since to approach it in mortal sin were itself mortal sin. For although our own Church also requires at least confession to God, and pronounces His absolution over us before we dare approach those holy Mysteries, yet because we are so far freed from our sins, that we may approach, to our salvation not to condemnation, yet can we say that we are so freed, that nothing remains to be washed away? that the absolution, which admits to that cleansing Blood, is every thing, that cleansing Blood Itself, in this respect also, addeth nothing? Rather, the penitent¹s comfort is, that, as, in S. Basil¹s words on frequent communion, "continual participation of life is nothing else than manifold life," so, often communion of that Body which was broken and that Blood which was shed for the remission of sins, is manifold remission of those sins over which he mourns, that as the loving-kindness of God admits him again and again to that Body and that Blood, the stains which his soul had contracted are more and more effaced, the guilt more and more purged, the wounds more and more healed, that atoning Blood more and more interposed between him and his sins, himself more united with his Lord, Who Alone is Righteousness and Sanctification and Redemption. Since then, this Divine Sacrament has, as its immediate and proper end, union with Him Who hath taken our manhood into God, and the infusion into us of His Spirit and life and immortality, making us one with His glorified Humanity, as He is One in the Godhead with the Father, and, besides this, it is ulteriorly, the cleansing of our sins, the refining our corruptions, the repairing of our decays, what must the loss of the Church of the latter days, in which Communions are so infrequent! How can we wonder that love should have waxed cold, corruptions so abound, grievous falls have been, among our youth, almost the rule, to stand upright the exception, Heathen strictness reproach Christian laxity, the Divine life become so rare, all higher instances of it be so few and faint, when "the stay and the staff," the strength of that life is willingly forfeited? How should there be the fulness of the Divine life, amid all but a month-long fast from our "daily Bread?" While in the largest portion of the Church, the people mostly gaze at the threshold of the Heaven where they do not enter, what do we? We seem, alas! even to have forgotten, in our very thoughts, that daily Communion, which once was the common privilege of the whole Church, which, when the Eastern Church relaxed in her first love, the Western continued, and which they from whom we have our Communion Service in its present form, at first hoped to restore. It implies a life, so different from this our common-place ordinary tenor, a life so above this world as knit with Him Who hath overcome the world; so Angelic as living on Him Who is Angels¹ Food; an union with God so close; that we cannot mostly, I suppose, imagine to ourselves, how we could daily thus be in Heaven, and in our daily business here below, how sanctify our daily duties, thoughts, refreshment, so that they should be tinged with the hues reflected by our daily Heaven, not that heavenly Gift be dimmed with our earthliness; how our souls should through the day shine with the glory of that ineffablePresence to which we had approached, now we approach to it with earth-dimmed souls. It must ever be so; we cannot know the Gift of God, if we forfeit it; we must cease mostly even to long for what we forego. We lose the very sense to understand it. It is not in blame of others, my brethren, God Forbid! it is as the confession of a common fault to which others have contributed least who have been least unworthy, and which, if we confess, God may the rather teach us how to amend, that I dare not but notice, how, even in this privileged and protected place, we still mostly forego even what remains, and what our Liturgy still enjoins. We have learned even, as people needs must, to justify the omission. As those who know not our privileges of daily service, think set daily prayers must become a lifeless form, so right-minded persons speak, (and perhaps until they know it, must needs speak,) as though not we needed more reverence to partake of the Communion weekly, but as though weekly Communions must needs decrease, not increase, reverence. And thus in this abode, which God has encompassed and blessed with privileges above all others, where so many have been brought into an especial nearness to Him, and a sacredness of office, so many look so to be brought, and yet on that account need the more watchfulness and Divine strength that they fall not,‹where, if we will, we may retire into ourselves, as much as we will, and have daily prayers to prepare our souls,‹we have, in very many cases, not even the privileges which are becoming common in village-Churches; we all, to whom it is expressly, as by name, enjoined, to "receive the Holy Communion with the Priest every Sunday at the least," have it perhaps scarcely monthly; and the thanksgiving for the Ascension of our Lord stands in our Prayer Book year by year unuttered, because when he ascended up on high to receive gifts for men, there are none here below to receive the Gift He won for us, or Himself Who is the Giver and the Gift. Nor has this been ever thus; even a century and a half ago, this Cathedral was remarked as one of those, where, after the desolation of the Great Rebellion, weekly Communions were still celebrated. But, however we may see that our present decay and negligence should not continue, restoration must not be rashly compassed. It is not a matter of obeying rubrics, but of life or death, of health or decay, of coming together for the better or for the worse, to salvation or to condemnation. Healthful restoration is a work of humility, not to be essayed as though we had the disposal of things, and could at our will replace, what by our forefathers¹ negligence was lost, and by our sins bound up with theirs is yet forfeited. Sound restoration must be the gift of God, to be sought of Him in humiliation, in prayer, in mutual forbearance and charity, with increased strictness of life and more diligent use of what we have. We must consult one for the other. There is, in our fallen state, a reverent abstaining from more frequent Communion, founded on real though undue fears; there is and ought to be a real consciousness that more frequent Communion should involve a change of life, more collectedness in God, more retirement, at times, from society, deeper consciousness of His Presence, more sacredness in our ordinary actions whom He so vouchsafeth to hallow, greater love for His Passion which we celebrate, and carrying it about, in strictness of self-rule and self-discipline, and self-denying love. And these graces, we know too well, come slowly. Better, then, for a time forego what any would long for, or obtain it, where by God¹s bounty and Providence that Gift may be had, than by premature urgency, "walk not charitably," or risk injury to a brother¹s soul. He Who alone can make more frequent Communion a blessing, and Who gave such strength to that one heavenly meal, whereby through forty days and forty nights of pilgrimage He carried Elijah to His Presence at the Mount of God, can, if we be faithful and keep His Gift which we receive, give such abundant strength to our rarer Communions, that they shall carry us through forty years of trial unto His own Holy Hill, and the Vision of Himself in bliss. Rather should those wh long for it, fear that if It were given them, they might not be fitted for it, or, if we have it, that we come short of the fulness of its blessing, than use inconsiderate eagerness in its restoration. Ask we it of God, so will He teach us, how to obtain it of those whom He has made its dispensers to us. They too have their responsibilities, not to bestow it prematurely, though they be involved in the common loss. Let us each suspect ourselves, not others; the backward their own backwardness, the forward their own eagerness; each habitually interpret well the other¹s actions and motives; they who seek to partake more often of the heavenly Food, honour the reverence and humility which abstains, and they who think it reverent to abstain, censure not as innovation, the return to ancient devotion and love; restore it, if we may, at such an hour of the day, when to be absent need not cause pain or perplexity, and may make least distinction; so, while we each think all good of the other, may we all together, strengthened by the Same Bread, washed by the Same Blood, be led, in the unity of the Spirit and the bond of peace and holiness of life, to that ineffable Feast, where not, as now, in Mysteries, but, face to face, we shall ever see God, and be ever filled with His Goodness and His Love. Meantime such of us, as long to be penitents, may well feel that we are less than the least of God¹s mercies; that we have already far more than we deserve; (for whereas we deserved Hell, we have the antepast of Heaven;) that the children¹s bread is indeed taken and given unto dogs; that He, Who is undefiled, spotless, separate from sinners, cometh to be a guest with us sinners; and therein may we indeed find our comfort and our stay. For where He is, how should there not be forgiveness and life and peace and joy? What other hope need we, if we may indeed hope that we thereby dwell in Him and He in us, He in us, if not by the fulness of His graces, yet with such at least as are fitted to our state, cleansing our iniquities and healing our infirmities, Himself the forgiveness we long for; we in Him, in Whom if we be found in that Day, our pardon is for ever sealed, ourselves for ever cleansed, our iniquity forgiven, and our sin covered.